The longest beetle is the Hercules beetle Dynastes hercules, with a maximum overall length of at least 16.7 cm (6.6 in) including the very long pronotal horn. The smallest recorded beetle and the smallest free-living insect (as of 2015), is the featherwing beetle Scydosella musawasensis which may measure as little as 325 µm in length. Buprestidae is a family of beetles known as jewel beetles or metallic wood-boring beetles because of their glossy iridescent colors. Larvae of this family are known as flatheaded borers. The family is among the largest of the beetles, with some 15,500 species known in 775 genera. In addition, almost 100 fossil species have been described.The larger and more spectacularly colored jewel beetles are highly prized by insect collectors. The elytra of some Buprestidae species have been traditionally used in beetlewing jewellery and decoration in certain countries in Asia, like India, Thailand and Japan. Insects in the family Elateridae are commonly called click beetles (or "typical click beetles" to distinguish them from the related families Cerophytidae and Eucnemidae). Other names include elaters, snapping beetles, spring beetles or skipjacks. This family was defined by William Elford Leach (1790–1836) in 1815. They are a cosmopolitan beetle family characterized by the unusual click mechanism they possess. There are a few closely related families in which a few members have the same mechanism, but all elaterids can click. A spine on the prosternum can be snapped into a corresponding notch on the mesosternum, producing a violent "click" that can bounce the beetle into the air. Clicking is mainly used to avoid predation, although it is also useful when the beetle is on its back and needs to right itself. There are about 9300 known species worldwide, and 965 valid species in North America. Darkling beetle is the common name of the large family of beetles, Tenebrionidae. The number of species in the Tenebrionidae is estimated at more than 20,000 and the family is cosmopolitan in distribution. Dermestidae are a family of Coleoptera that are commonly referred to as skin beetles. Other common names include larder beetle, hide or leather beetles, carpet beetles, and khapra beetles. There are approximately 500 to 700 species worldwide. They can range in size from 1 to 12 mm. Key characteristics for adults are round oval shaped bodies covered in scales or setae. The (usually) clubbed antennae fit into deep grooves. The hind femora also fit into recesses of the coxa. Larvae are scarabaeiform and also have setae. Dermestids have a variety of habits; most genera are scavengers that feed on dry animal or plant material, such as skin or pollen, animal hair, feathers, dead insects and natural fibers. Members of Dermestes are found in animal carcasses, while others may be found in mammal, bird, bee, or wasp nests. Thaumaglossa only lives in the egg cases of mantids, while Trogoderma species are pests of grain. These beetles are significant in forensic entomology. Some species are known to be associated with decaying carcasses, which helps with criminal investigations. Some species are pests (urban entomology) and can cause extensive damage to natural fibers in homes and businesses. They are used in taxidermy and by natural history museums to clean animal skeletons. Some dermestid species, commonly called "bow bugs", infest violin cases, feeding on the bow hair. Dung beetles are beetles that feed partly or exclusively on feces (dung). A dung beetle can bury dung 250 times heavier than itself in one night.Many dung beetles, known as rollers, roll dung into round balls, which are used as a food source or breeding chambers. Others, known as tunnelers, bury the dung wherever they find it. A third group, the dwellers, neither roll nor burrow: they simply live in manure. They are often attracted by the dung collected by burrowing owls. There are dung beetle species of different colours and sizes, and some functional traits such as body mass (or biomass) and leg length can have high levels of variability.All the species belong to the superfamily Scarabaeoidea; most of them to the subfamilies Scarabaeinae and Aphodiinae of the family Scarabaeidae (scarab beetles). As most species of Scarabaeinae feed exclusively on feces, that subfamily is often dubbed true dung beetles. There are dung-feeding beetles which belong to other families, such as the Geotrupidae (the earth-boring dung beetle). The Scarabaeinae alone comprises more than 5,000 species.The nocturnal African dung beetle Scarabaeus satyrus is the only known non-vertebrate animal to navigate and orient itself using the Milky Way. The Lampyridae are a family of insects in the beetle order Coleoptera with over 2,000 described species. They are soft-bodied beetles that are commonly called fireflies or lightning bugs for their conspicuous use of bioluminescence during twilight to attract mates or prey. Fireflies produce a "cold light", with no infrared or ultraviolet frequencies. This chemically produced light from the lower abdomen may be yellow, green, or pale red, with wavelengths from 510 to 670 nanometers. Some species such as the dimly glowing "blue ghost" of the Eastern US are commonly thought to emit blue light (<490 nanometers), though this is a false perception of their truly green emission light due to the Purkinje effect.Fireflies are found in temperate and tropical climates. Many are found in marshes or in wet, wooded areas where their larvae have abundant sources of food. Some species are called "glowworms" in Eurasia and elsewhere. While all known fireflies glow, only some adults produce light and the location of the light organ varies between species and sexes of the same species. The form of the insect which emits light varies from species to species (for example, in the glow worm found in the UK, Lampyris noctiluca, it is the female that is most easily noticed.). In the Americas, "glow worm" also refers to the closely related family Phengodidae. In New Zealand and Australia the term "glow worm" is in use for the luminescent larvae of the fungus gnat Arachnocampa. In many species of fireflies, both male and female fireflies have the ability to fly, but in some species, the females are flightless. Ground beetles are a large, cosmopolitan family of beetles, Carabidae, with more than 40,000 species worldwide, around 2,000 of which are found in North America and 2,700 in Europe. It is one of the ten most speciose animal families, as of 2015. The longhorn beetles (Cerambycidae; also known as long-horned or longhorn beetles or longicorns) are a cosmopolitan family of beetles, typically characterized by extremely long antennae, which are often as long as or longer than the beetle's body. In various members of the family, however, the antennae are quite short (e.g., Neandra brunnea) and such species can be difficult to distinguish from related beetle families such as the Chrysomelidae. The family is large, with over 26,000 species described, slightly more than half from the Eastern Hemisphere. Several are serious pests. The larvae, called roundheaded borers, bore into wood, where they can cause extensive damage to either living trees or untreated lumber (or, occasionally, to wood in buildings; the old-house borer, Hylotrupes bajulus, is a particular problem indoors). A number of species mimic ants, bees, and wasps, though a majority of species are cryptically colored. 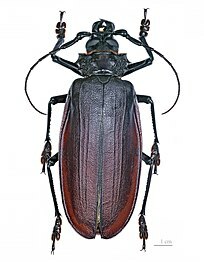 The rare titan beetle (Titanus giganteus) from northeastern South America is often considered the largest (though not the heaviest, and not the longest including legs) insect, with a maximum known body length of just over 16.7 cm (6.6 in). The scientific name of this beetle family goes back to a figure from Greek mythology: after an argument with nymphs, the shepherd Cerambus was transformed into a large beetle with horns. The family Scarabaeidae as currently defined consists of over 30,000 species of beetles worldwide, often called scarabs or scarab beetles. The classification of this family has undergone significant change in recent years. Several subfamilies have been elevated to family rank (e.g., Pleocomidae, Glaresidae, Glaphyridae, Ochodaeidae, and Geotrupidae), and some reduced to lower ranks. The subfamilies listed in this article are in accordance with those in Bouchard (2011). Volkswagen (German: [ˈfɔlksˌvaːɡn̩] (listen)); English: ); shortened to VW (German: [ˈfaʊ̯ˈveː]), is a German automaker founded on 28 May 1937 by the German Labour Front, and headquartered in Wolfsburg. It is the flagship marque of the Volkswagen Group, the largest automaker by worldwide sales in 2016 and 2017. The group's main market is in China, which delivers 40% of its sales and profits.Volkswagen translates to "people's car" in German. The company's current international advertising slogan is just "Volkswagen", referencing the name's meaning. The Volkswagen Beetle—officially the Volkswagen Type 1, informally in German the Käfer (meaning "beetle"), in parts of the English-speaking world the Bug, and known by many other nicknames in other languages—is a two-door, rear-engine economy car, intended for five occupants (later, beetles were only allowed for four people in some countries), that was manufactured and marketed by German automaker Volkswagen (VW) from 1938 until 2003.The need for a people's car (Volkswagen in German), its concept and its functional objectives were formulated by the leader of Nazi Germany, Adolf Hitler, who wanted a cheap, simple car to be mass-produced for his country's new road network. Lead engineer Ferdinand Porsche and his team took until 1938 to finalise the design. The influence on Porsche's design of other contemporary cars, such as the Tatra V570, and the work of Josef Ganz remains a subject of dispute. The result was the first Volkswagen, and one of the first rear-engined cars since the Brass Era. With 21,529,464 produced, the Beetle is the longest-running and most-manufactured car of a single platform ever made. Although designed in the 1930s, due to World War II, civilian Beetles only began to be produced in significant numbers by the end of the 1940s. The car was then internally designated the Volkswagen Type 1, and marketed simply as the Volkswagen (or "People's Car"). Later models were designated Volkswagen 1200, 1300, 1500, 1302, or 1303, the former three indicating engine displacement, the latter two derived from the model number. The car became widely known in its home country as the Käfer (German for "beetle", cognate with English chafer) and was later marketed under that name in Germany, and as the Volkswagen in other countries. For example, in France it was known as the Coccinelle (French for ladybug).The original 25 hp Beetle was designed for a top speed around 100 km/h (62 mph), which would be a viable cruising speed on the Reichsautobahn system. As Autobahn speeds increased in the postwar years, its output was boosted to 36, then 40 hp, the configuration that lasted through 1966 and became the "classic" Volkswagen motor. The Beetle gave rise to multiple variants: mainly the 1950 Type 2 'Bus', the 1955 Karmann Ghia, as well as the 1961 Type 3 'Ponton' and the 1968 Type 4 (411/412) family cars, ultimately forming the basis of an entirely rear-engined VW product range. The Beetle thus marked a significant trend, led by Volkswagen, and then by Fiat and Renault, whereby the rear-engine, rear-wheel-drive layout increased from 2.6 percent of continental Western Europe's car production in 1946 to 26.6 percent in 1956. In 1959 even General Motors launched an air-cooled, rear-engined car, the Chevrolet Corvair — which even shared the Beetle's flat engine and swing axle architecture. Over time, front-wheel drive, and frequently hatchback-bodied cars would come to dominate the European small-car market. In 1974, Volkswagen's own front-wheel drive Golf hatchback succeeded the Beetle. In 1994, Volkswagen unveiled the Concept One, a "retro"-themed concept car with a resemblance to the original Beetle, and in 1998 introduced the "New Beetle", built on the contemporary Golf platform with styling recalling the original Type 1. It remained in production through 2010, and was succeeded in 2011 by the Beetle (A5), which was also more reminiscent of the original Beetle.